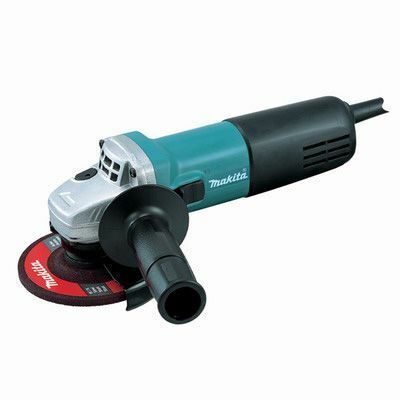 Makita angle grinder weighs just 1.8kg and runs at 710W. The Makita 9554HNG has a small circumference body for easy handling.The Makita Grinder 9554HNG is a compact yet powerful one-hand grinder. It features a Labyrinth construction that protects its ball bearings from dust and debris. The small circumference of its body makes it easy to handle. It operates at 710W and measures 258 x 129 x 106mm. It is made lightweight at 1.8kg, and the depressed abrasive center wheel measures 115mm. This power tool features a no-load speed of 10000RPM and has a DIN type spindle thread. It comes with a 2.5m power cord that allows for easy movements around the work area. The Makita 9554HNG’s armature is coated with protective zig-zag varnish, while the field is coated with powder varnish to protect the motor from dust and wire breakage, thus ensuring durability for masonry cutting. The Makita angle grinder has a double-insulated body for safe handling as it protects the operator against any potential electric shocks. The compact build with an ergonomic design makes it suitable for single-handed usage.